Copyright © 2013 Special Weapons For Military & Police. All rights reserved. Used by permission. Owing to the cartridge’s relative newness in commercial circles, few shooters realize that the .338 Lapua Mag will be 24 years old this year. The Dutch Army’s procurement of the round in 1989 established it as a NATO cartridge, and Accuracy International’s chambering of rifles for .338 Lapua helped proliferate it throughout military sniping circles. The load’s commercial availability and adoption by several commercial firearms manufacturers have set the course for its widespread use. 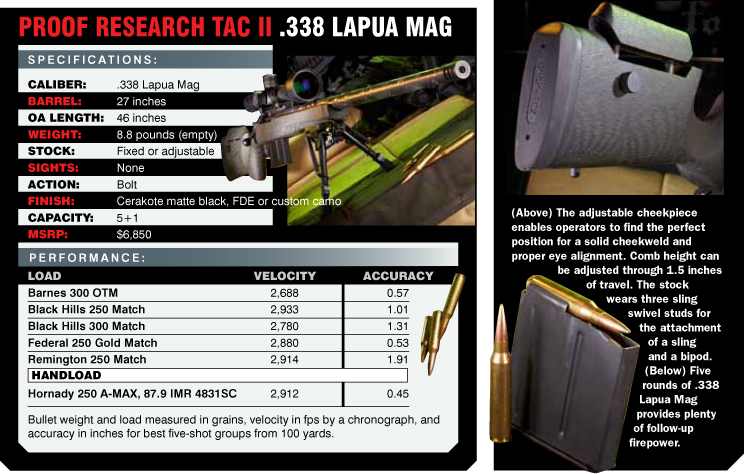 As a cartridge for long-range sniping engagements, the .338 Lapua Mag has few equals: Corporal of Horse Craig Harrison, using his Accuracy International L115A3 rifle in .338 Lapua, set a record in November 2009 with a 2,707-yard kill in Afghanistan; the late Chief Petty Officer Chris Kyle had a 2,100-yard kill with his McMillan Tac-338 in the Iraq War. 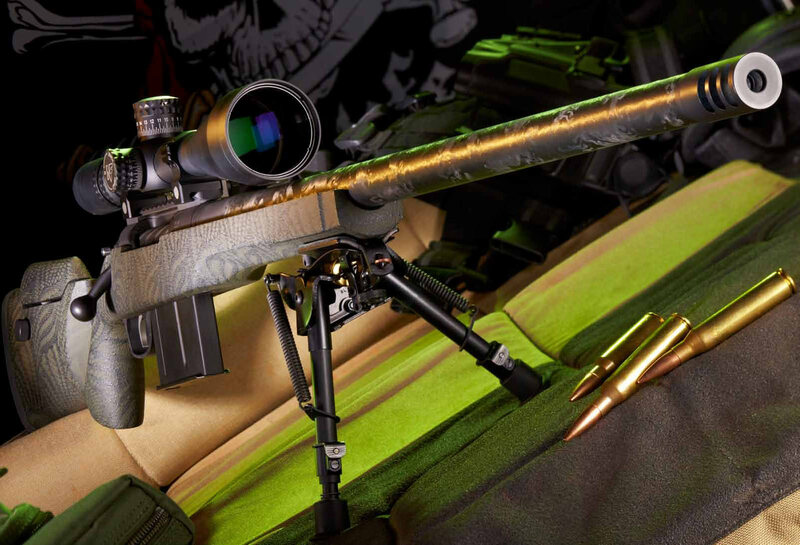 With the goal of building a reli­able long-range rifle system, Proof Research made the shrewd decision to chamber its Tactical II bolt action for .338 Lapua Mag. With an excellent overall weight, the rifle is designed around the three most important elements to any system along with a few new twists: Proof’s patented, carbon-fiber-wrapped barrel, hand-laid composite stock and T6 tactical action combine for an incredible shooting solution. Like Proof’s SOCOM I, the Tactical II (TAC II) is designed from the ground up to be a versatile and lightweight tactical system for the serious shooter. The differences in the TAC II’s cheekpiece, vertical grip and lower-profile forend are subtle, but important. Starting at the forend tip, the stock is significantly slimmed down to where only about 0.75 inches of material span the distance from the bottom of the barrel channel to the bottom of the forend. That contour rides back for nearly 12 inches to a more traditional thickness, from the top to the bottom of the stock at the midpoint of the barrel chamber area. Flowing to the rear, the stock’s graceful lines sweep down at the vertical pistol grip. This pronounced, nearly vertical pistol grip aids in shooter comfort by offering a hand position that will lessen wrist fatigue during long periods on the gun. To allow individual adjustment, the comb raises via a twin pillar system that locks in place with a thumbscrew on the right side of the stock. Comb height can be adjusted through 1.5 inches of travel. The stock also wears three sling swivel studs, one aft and two fore, to provide an attachment point for a sling as well as a bipod. 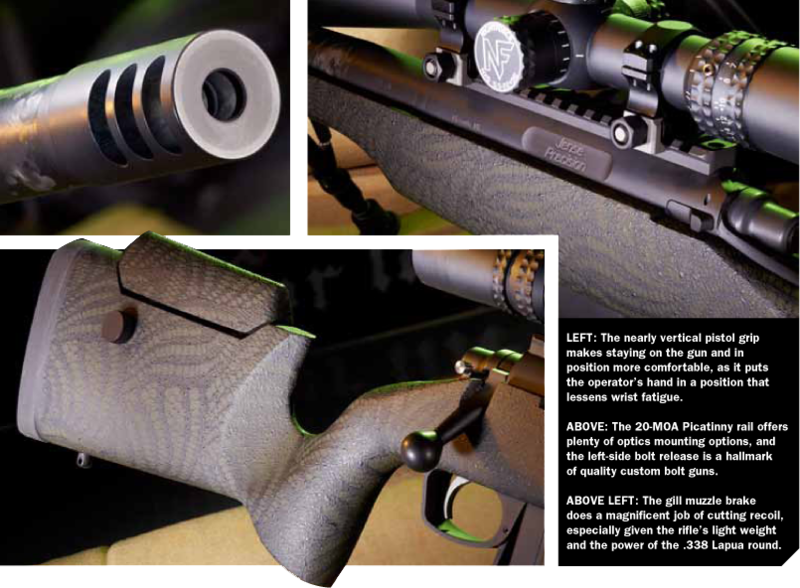 The rifle tested wore a textured OD green finish. Proof’s T6 action bears a lot of resemblance to a Remington 700, but there are some differences. The bolt is spiral fluted and fitted with an ultra-reliable M16-style extractor. The top of the receiver is fitted with a 20-MOA Picatinny rail, and the bottom metal is made by Badger Ordnance. The beefed-up action appropriately includes a detachable, vertical-stack, five-shot box magazine made by Accuracy International. A sought-after feature on sniper rifles, a forward-activated, paddle magazine release is included on the TAC II and allows the shooter to drop the magazine without releasing the primary hand grip. 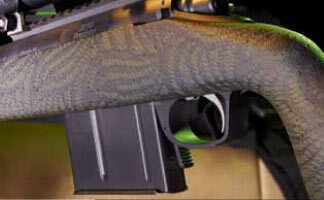 The index finger can activate the magazine release without removing the hand from the stock. The TAC II comes from the factory with your choice of either a Jewell or Timney trigger. The rifle tested wore a Jewell fire control unit, and the trigger broke crisply and cleanly at a precise 2 pounds. 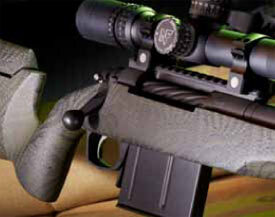 The bolt release differs from a Remington Model 700 action. Instead of a release incorporated into the trigger unit, the release is on the rear left side of the action. This is the same bolt release found on other custom or semi-custom actions made by Defiance Machine of Columbia Falls, Montana. 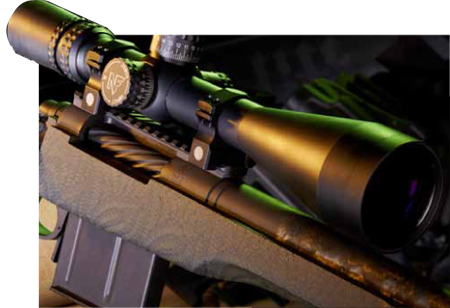 The TAC II’s most standout feature is its barrel, a stainless tube wrapped in carbon fiber. The barrel is the primary reason for the rifle’s light weight without an optic. The rifle I tested is fitted with a 27-inch barrel tipped with a three-port, 416 stainless steel muzzle brake. The barrel is full-diameter steel surrounding the chamber, and the carbon-fiber wrap picks up about 3.5 inches from the front of the receiver. 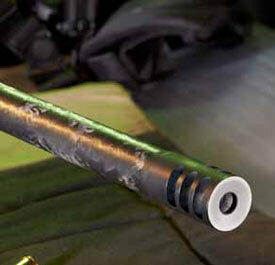 Finished in a dark color, it blends well with the rest of the rifle’s gray and OD green finishes. To tame the recoil of a .338 Lapua Mag rifle, you need a muzzle brake. Without it, the recoil in a rifle weighing 14 to 17 pounds (let alone the TAC II’s 8.8 pounds) is painful. So the TAC II’s manageable recoil is a testament to the effectiveness of the muzzle brake. After considerable trigger time with nearly a dozen sniper systems chambered in .338 Lapua, I have some favorites. Typically, my choices come down to the rifles that consistently produce tight groups and are easy to transport, and several of those were also top contenders in SOCOM’s Precision Sniper Rifle (PSR) trials. These sniper rifles typically weigh 16 to 17 pounds kitted out with optics and bipods. It is significant that the TAC II weighs about 5 pounds less when fitted with an optic. Although touted as a long-range, light-weight sniper rifle, the TAC II could easily double as a respectable elk rifle. To squeeze the most accuracy from this rifle, I mounted a Nightforce 5.5-22x scope in a set of high Trijicon rings. To capture velocity data, I set up a chronograph and fired 10-shot strings at 15 feet. Letting the gun cool between five-shot strings, I wrapped up the velocity recording for several loads in about an hour. Then I moved to my 100-yard bank of targets to find the most accurate loads by shooting five-shot groups. First, I selected Barnes Bullets 300-grain Open Tip Match loads made for Remington Defense. These are military-grade loads that were specified by former Army snipers who now work for Remington. These “factory” loads were the ones fired in the Remington MSR during the PSR trials to win the SOCOM contract. Needless to say, they tend to shoot well. The second load tested was the Black Hills 300-grain, with which I fired three five-shot groups. I got back on the gun after a break to let it cool again and fired two five-shot groups with Black Hills 250-grain loads. Then I fired Federal’s 250-grain Gold Medal Match and Remington’s 250-grain Match. Also, I have worked up several loads using 250-grain Hornady A-MAX bullets for various rifles chambered for .338 Lapua Mag. So far, 87.9 grains of IMR 4831SC and Federal Large Rifle Magnum primers have turned out five-shot groups that average under 1-MOA, and with the TAC II the smallest group measured 0.45 inches. Now that the hard work was finished, it was time for some fun. I set up a reactive, 8-inch, 10-twist spring steel target at a quarter-mile. After a couple of shots to refine my scope adjustments, ringing the steel became rather routine with several different loads. Since conditions were optimal with virtually no wind, I decided to raise the bar by moving the target to 700 yards. I had a box of Federal Match loads left, so I dialed in the distance and began launching the 250-grain slugs downrange. It took me five shots to finally see impact at that distance and make corrections. As light faded, I was able to put 11 of 15 rounds on target. The other four rounds would have resulted in torso hits on a man-sized target. The relatively new technology of carbon-wrapped barrels has several benefits, the first of which is reduced weight. In tactical situations, transporting less weight is always better than the alternative. The fact that accuracy hovers just above half-MOA with selected loads for a round that pulls duty for both anti-personnel and anti-materiel applications should be a good fit for any SWAT team wanting to upgrade its gear. For more information, visit proofresearch.com or call 406-756-9290.